Order seed, bulb, and nursery catalogs to assist in planning your garden for the new year. To help you choose the best plants for your garden, take advantage of the Garden's online resource Illinois' Best Plants, as well as its Plant Information Service, Lenhardt Library, and the Joseph Regenstein, Jr. School of the Chicago Botanic Garden. See seed-starting advice in "Indoor Plant Care" below. Recycle Christmas tree branches (cut into 2- to 3-foot sections), swags, wreaths, and other evergreen material as mulch for garden and perennial beds. 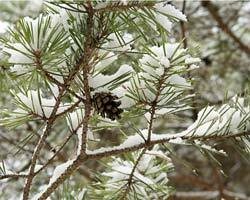 Lightweight, open evergreens permit moisture to reach the soil but also insulate the roots and crowns of plants from the freeze-thaw-freeze cycle of Midwest winters. An alternative use for a holiday tree is to set it in the backyard and decorate it with bird seed and suet ornaments for winter birds. Continue to supply fresh water for birds. When clearing driveways or shoveling walks, distribute snow loads equitably on shrubs and garden beds. Continue to use potassium- or calcium-based deicing products on walkways rather than sodium-based ones. If possible, broadcast sand on slippery surfaces. Always shovel snow before using any de-icing product. During periods of winter thaw, water garden beds, turf, and plants that have received salt spray from roads. 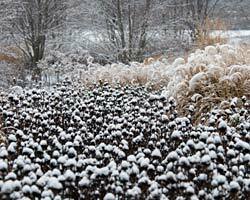 Monitor plants for signs of damage from animals, ice, snow, or wind. Keep ponds free of ice by installing small pumps or pouring warm water over ice as it begins to form. Don’t bang ice with a heavy object if you have fish in the pond. Continue to keep the garden tidy by removing any broken or fallen branches from the yard. If small plants have heaved out of the ground, gently press them back with your hands; avoid compressing thawed ground with heavy boots. Retie any vines that might have been torn from their supports. Later this month, selectively prune branches from flowering trees and shrubs and bring them indoors for forced blooming. Most flowering plants can be successfully forced if they have had at least a six-week cold period. Even branches with only foliage can make interesting arrangements. For flowering plants, choose branches with plenty of fat flower buds. Prune carefully, using proper pruning techniques, taking care not to interfere with the natural shape of the tree or shrub. Branches should be at least 1 foot long, cut when the temperature is above freezing. Lay branches overnight in a bathtub filled with room-temperature water. Make cross cuts in stem ends or smash the ends of very large branches so they can quickly take up water. Arrange them in a bucket or vase and keep them in a 60-degree room out of direct sunlight. Change the water every other day. As buds begin to swell or color up, make final arrangements and bring into a cool room, out of direct sun. Good choices for forcing in January and February include serviceberry (Amelanchier), magnolia (Magnolia), flowering quince (Chaenomeles), forsythia (Forsythia), crabapple or apple (Malus), flowering pear (Pyrus), flowering cherry (Prunus), honeysuckle (Lonicera), spring-flowering witch hazel (Hamamelis vernalis) and redbud (Cercis). Light pruning of deciduous trees and shrubs can be done this month, weather permitting. Heavy pruning is best done in late winter or early spring immediately before bud break. Another time to prune ornamental flowering trees is immediately after they flower. (This avoids sacrificing their spring flower display.) Fruit trees are best pruned in late February or early March. Oak trees must be pruned in dormant months to minimize risk of oak wilt disease. Immediately prune back any branches damaged by snow and ice. If tree branches become covered with ice, let the ice melt naturally rather than cracking it with a heavy object. If large evergreen branches are anchored to the ground with snow, gently sweep off snow with a soft broom and then elevate the tree branch from underneath. Using heavy objects like shovels risks cutting the tree bark — a possible point of entry for infection and insect attack. Continue to monitor for animal damage if this has been a problem in the past. Rabbits will gnaw or strip off lower bark from trees. They can stand on top of snow piles to reach higher up on trees. Young bucks will rub their antlers on tree trunks as they try to remove the velvet. Create physical barriers such as deer netting, snow fencing, or hardware cloth tacked around tree trunks. Check newly planted softwood trees for frost cracks or sun scald injury that might occur when winter temperatures fluctuate dramatically from a sunny warm day to a subzero night. Consider wrapping vulnerable tree trunks with protective wrap in fall and remove wrap in spring. If necessary, construct burlap screening supported by wooden stakes to protect evergreens in path of salt spray. This is the month to check host plants for overwintering Eastern tent caterpillar egg cases. Check crabapple, apple, hawthorn, mountain ash, flowering cherry, and other members of the rose family for signs of dark, iridescent egg cases encircling small twigs, giving a pencil-like shape to the twig. Amaryllis bulbs that have flowered will now send up leaves. Allow the flower stalk to yellow and wither before removing it from the bulb. Keep bulb and leaves in bright light and continue with normal watering. After May 15, take the potted bulb with long, straplike leaves outside and place it in the garden where it receives morning sun. Fertilize every 10 to 14 days with a liquid 10-10-10 or 15-15-15 mix. The fertilizer is necessary to replenish the bulb for a new season’s flower display. In fall, before the Chicago area’s average frost date of October 15, bring the bulb inside for its resting period. If leaves have yellowed, remove them from the bulb. If they are still green, allow them to yellow before removing them from the bulb. Take the bulb out of its pot, shake off dirt, and place in a cool (40 to 50 degrees), dark room. Signs of new green growth can occur eight to 12 weeks later. At that time, cut off any dried roots from the bulb and repot it in a short, wide pot, using soilless mix. Water well this first time but then let the soil dry a bit before watering again. Place the pot in bright, indirect light and rotate the pot as the flower stalk begins to grow, thus assuring straight growth. Flowering azaleas will bloom for months in a bright window when provided with even moisture, occasional misting, and quick removal of spent blossoms. The plant can be taken outside to a partially shaded spot in the garden once all danger of frost has passed in May. At that time, begin to fertilize twice a month with a dilute 10-10-10 solution. Some gardeners prefer to use a liquid fertilizer especially for acid-loving plants. Bring the plant back indoors before fall frost arrives. Cyclamen plants will continue to bloom for a few weeks if they are kept in a north window in a quite cool room (55 to 60 degrees) and watered enough to keep the soil evenly moist, never soggy. Avoid splashing the crown of the plant or the foliage as this might promote mold. Remove fading flowers and their stems as needed. Most gardeners find it too difficult to force the plant to bloom again the following season. Those willing to take the challenge should follow these suggestions. As foliage and flowers begin to fade, withhold water. Remove all dead foliage from the tuber, clean off the soil, and store the tuber in peat moss or vermiculite in a dark, cool (50 degrees) spot for its dormant period. Later in spring or summer, check the tuber for new growth. As soon as growth begins, repot the tuber with its top half exposed and bottom half buried in fresh soilless mix. Resume normal watering and fertilize with a dilute 10-10-10 or 15-15-15 mix twice a month. Cyclamen benefits from summers spent outside in a protected spot in the garden where it receives morning sun. Bring the plant indoors before autumn frost. 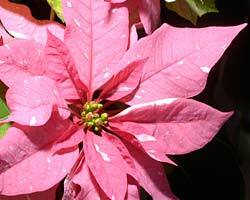 Poinsettia plants can also be a challenge to keep year-round, and most gardeners discard the plant after the holidays. However, those trying to force it to rebloom the following season can follow these guidelines. As long as the plant looks healthy, continue to provide it with even moisture, warm temperatures in a bright location, out of direct sun. In six to eight weeks, it will begin to lose its leaves and turn slightly off-color. At that point, cut the entire plant back to 6 inches and repot in a larger pot, adding enough extra soilless mix or potting soil to fill the pot. Water thoroughly and place in a south-facing window. Begin to fertilize twice a month with a dilute 20-20-20 mix. New growth should begin. Begin pinching new stems back once a month to encourage bushy growth. Continue this pinching until the end of summer. In mid-May, after all danger of frost has passed, gradually introduce the plant to the outdoors, bringing it back in at night until the nighttime temperature remains above 60 degrees. Place the pot in a sunny spot where it is protected from strong, afternoon summer sun. Water and fertilize regularly. When night temperatures approach 60 degrees, it’s time to bring the plant inside to a sunny windowsill. By the end of September, the plant must be placed in a completely dark closet or covered with a plastic bag every night from 5 p.m. to 8 a.m. — no exceptions! After 8 a.m., it may be placed back in a sunny window but must be returned to the closet at 5 p.m. This dark treatment is necessary for the plant to set its flower buds. Provide normal water and monthly fertilizer during the day. Poinsettia plants thrive in warm rooms with bright light and suffer if exposed to drafts, sudden temperature changes, or excess dryness from heating vents. Continue this treatment until the middle of December, when the plant should be fully colored up and can remain on display for the holidays. Moth orchid, or Phalaenopsis, will bloom for months during the winter. Continue to provide bright light and keep it out of direct sun in a warm room. During the winter, try to provide extra humidity from pebble trays or humidifiers, or move the plant into a bright bathroom where humidity is high from daily showers. Flowers and developing buds will drop if the plant is moved to a cold room or exposed to drafts. After flowering, allow the stem to yellow before cutting it off at the base of the plant. Now begin to fertilize the plant twice a month with a dilute orchid fertilizer. Wash the foliage monthly. It’s not necessary to take this plant outdoors for the summer; it actually prefers indoor conditions. Continue normal watering and fertilizing until a new stem appears, approximately 10 to 12 months later. When the plant initiates flower buds, discontinue fertilizing. Any hardy tulips, daffodils, grape hyacinths, or other hardy bulbs that were planted in soil and displayed over the holidays should be treated in the same manner as they would if they were growing outdoors. After blooming, allow the foliage to yellow and wither before removing it from the bulb. Continue to water the bulbs as the soil dries out and fertilize monthly with a 10-10-10 or 15-15-15 dilute fertilizer. Plant the bulbs outside in April or May in a sunny location with good drainage. As you would with other bulbs, plant them at a depth equal to three times their height. Bulbs will not bloom again until the following spring. Most houseplants require less water and much less, if any, fertilizer, because they slow their growth during this semidormant winter period. Succulent plants, such as cacti and jade plants, are in a winter dormancy and require bright light but very cool conditions with no water for up to two months. Overwatering will create soft brown patches on stems and foliage. Spider mites — Look for webbing in leaf axils, stippled foliage, and weak, off-color leaves. Mites are often difficult to see without a lens. Scale — Characteristic sticky, clear honeydew is produced on leaves by these small, immobile, rounded insects usually found on stems and veins of leaves. Mealybugs — Easy to spot, these insects resemble crowds of tiny cotton puffs. Whitefly — Whiteflies are a major problem in many greenhouses because they can quickly move to neighboring plants. Look for tiny, white, mothlike insects often found on the undersides of leaves. Fungus gnats — The adult black gnats fly around the plant but do no damage. The immature larvae in the moist soil can chew plant roots. 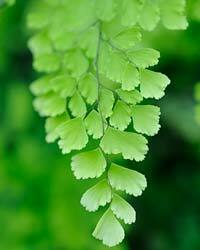 They are often a problem in overwatered plants or overly moist flats of seedlings. Herbs growing on windowsills, as well as smaller houseplants, can benefit from spending a few months under artificial lights to supplement the diminished natural sunlight. Homeowners can construct a light table using two 40-watt fluorescent lights, one cool and one warm, for each foot of shelf space filled with plants. Try to group plants with similar heights together so the light fixture can be set as close to the plants as possible — a few inches above the plants is best. Keep the lights on for 14 to 16 hours a day. Start seeds for early spring annuals requiring a long lead time before being set out in the garden. Follow directions on individual packets as to which types of seeds require bottom heat, light or darkness in order to germinate. Some seeds might require a short period of chilling before being sown. Cool-season annuals (larkspur, snapdragon, English daisy, ranunculus, monkey flower, pansy, annual poppy, forget-me-not, edging lobelia) can be planted outside in the garden by the second week in April after the small plants are hardened off. This may require starting seeds 14 weeks ahead in order to have blooming plants ready for outside planting. Sow seeds in fiber pots or trays, using a premoistened, soilless or seed-starting mix. Sow large seeds in slightly indented rows and cover lightly with a thin layer of the mix. Finer seeds may be broadcast directly on top of soil. Some types of seeds will require a glass or plastic cover to provide supplemental humidity. Water seeds from the bottom or use a fine mister to keep the soil moist. Most seeds require a warm, bright location out of direct sun to germinate. Ventilate covered seeds daily, especially in bright conditions. When germination occurs, gradually increase light levels. When two sets of true leaves develop, transplant small seedlings to a larger fiber pot that contains a slightly coarser, "growing-on" mix. Continue to water from the bottom to encourage strong root development. Begin fertilizing with quarter-strength 10-10-10 solution. As the plant grows larger, switch to a half-strength solution once a week. Harden plants off approximately seven to 10 days before setting them out. Take them outside for a few hours a day and back in again at night. Gradually increase the time spent outside until they are ready to be planted in containers, window boxes, or garden beds.